Put your cursor at the end of the text you want to cite. Go to References > Style, and choose a citation style. Choose Add New Source and fill out the information about your source. Go to References > Insert Citation, and choose the source you are citing. 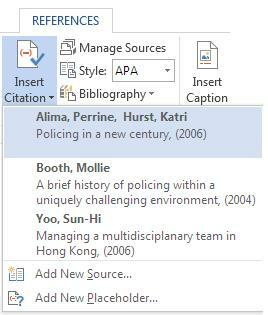 To add details, like page numbers if you're citing a book, select Citation Options, and then Edit Citation. With cited sources in your document, you're ready to create a bibliography. Put your cursor where you want the bibliography. Go to References > Bibliography, and choose a format. 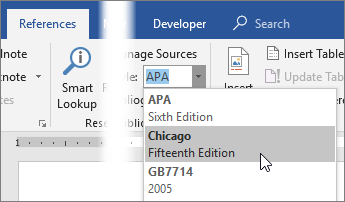 Tip: If you cite a new source, add it to the bibliography by clicking anywhere in the bibliography and selecting Update Citations and Bibliography.